After the look at home parking earlier last month, we now look at the busier areas of many Dutch cities again. Especially around the shopping areas in the city centres and near the railway stations the number of parked bicycles is astonishing, even to the Dutch themselves. These areas have really been filling up with parked bicycles in recent years. The huge numbers of bicycles make parking difficult and the areas become increasingly less attractive with that many bicycles. Emergency services have been complaining that they cannot reach certain areas in time any more. Reason for many local authorities to deal with this challenge. All over the country large bicycle parking facilities opened their doors. I give you three examples that opened in a relatively short period, from December 2010 to June 2011. You can see that the modern bicycle parking facilities in the Netherlands share important characteristics: spacious, light, clean and free to use. The reason for all these things: if you want people to use these facilities they have to be inviting. Which is of course necessary for all bicycle infrastructure: it has to be perfect and so inviting that you simply want to use it. Modern Dutch bicycle parking facilities are clean, light and spacious. The largest of the three examples I give you, opened on the 13th December 2010 in Haarlem. Directly under the bus station in front of the Central Railway Station building, an enormous underground bicycle facility has room to park exactly 5,020 bicycles. In this facility only standard bicycles can be parked. No bakfietsen, no mopeds and no scooters. For these types of vehicles there is a separate facility on ground level. This makes that the racks could be standardised and no expensive elevator was needed. There is one entrance for bicycles from the main cycle route into the city. There are several exits to leave the building once you have parked your bicycle. One to the square and one directly to the train platforms. But you can also leave the building through the main bicycle entrance. Parking your bicycle is free. There is always someone on guard. This person also takes care that the facility stays orderly and clean, that bicycles are not parked outside the racks and he or she also enhances the feeling of social safety. This free underground bicycle parking looks fresh, spacious and light, also to make it pleasant to be there. There is also a free pump to give your tyres some extra pressure if necessary. The facility is open from 5:00 am to 2:00 am. So 21 hours per day, from before the first train departs until after the last train arrives. The underground bicycle parking facility at the Haarlem Central Railway Station. 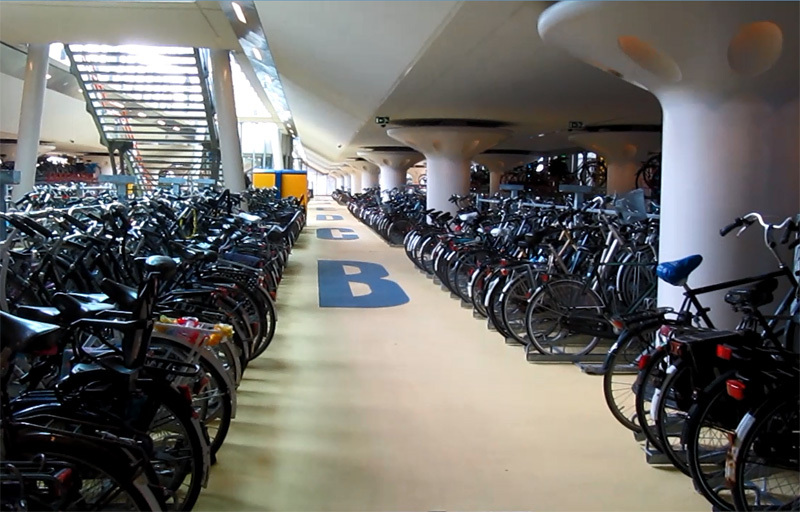 The Houten bicycle parking facility was opened on Saturday 16th April 2011. Houten calls it a ‘Transferium’ because it is a perfect location to ‘transfer’ from one mode of transport to the other. The bicycle parking facility for over 3,000 bicycles is located directly under the railway tracks and platforms. Which makes the bicycle parking facility an important and integrated part of the station. Parking is guarded and free of charge. There are additional services like maintenance, repair and rental bikes. But there are also lockers and toilets and even the Tourist Office is located in the same building as well. The lightness and the bright colours are not just making the facility pretty, coupled with the fact that all passengers walk right through it, and there is someone present at all time, it creates a high level of social safety. The bicycle parking facility opens daily just before the first train leaves in the early morning and closes only after the last train arrives in the late night. Which on weekdays is from 5 am to 1:15 am. In Houten 60% of the train travellers arrive by bicycle (the average for the entire country is 40% but this figure is rising everywhere). The ‘transferium’ Houten offers an excellent ‘transfer’ from one mode to the other. Unlike the first two examples the Zaandam facility is not for the train traveller but for people who arrive by bicycle to the Zaandam city centre to go shopping. The facility is called Fietsenpakhuis (Bicycle Warehouse) and houses 700 bicycles. The building was opened on 1st June 2011. Parking your bicycle is free. This facility has also room for bakfietsen, mopeds/scooters and even mobility scooters. The opening hours are from half an hour before shops open to half an hour after the shops close. Parked bicycles are guarded and there are also extra services. You can get rental bikes, but also rental baby buggies to go shopping with your children and even walkers can be rented, for people who can still cycle well but not walk so easily any more. You can have your bicycle repaired and there are public restrooms (of which there are really only few in the Netherlands). Like the other examples this building is light and open and there is always someone present. The Zaandam ‘Bicycle Warehouse’ (Fietsenpakhuis) in the shopping centre of the city. The videos of Houten and Zaandam were originally part of longer previously published videos. They were now changed to show only the bicycle parking facilities. The Haarlem video is completely new. Huge indoor bicycle parking facilities, equal to building massive parkades in North America. What’s next, ambulances being large bakfiets with an e-assist or motor to get around quicker with sirens and traffic light transmitters to get the green light at traffic lights and flashing lights to ensure people let them go first? Police on wheelrunners? This article got me thinking about the five indoor parking facilities that will be built within the next two years at some of the passenger train stations in Los Angeles county and how providing any bicycle parking is only a fairly recent phenomenon by the LA county Metro transit agency that controls this. The North Hollywood subway station has the most passenger boarding’s of the 80 light rail and subway stations under the LA county Metro system and yet when it opened in 2000 there was no bicycle parking spaces provided. Metro then began to notice that there were more and more bicycles locked around trees and sign posts. This subway station now has the most parked bicycles of any train station in the system with 135 rack and locker spaces and is slated to have a indoor parking facility next year, albeit it will more than likely have spaces for only a few hundred bicycles. In 2010 Metro counted 90 bicycles either parked or moving in or out of the North Hollywood subway, at the off-street bus rapid transit system station across the street, or on the parallel bike lanes that run on either side of it in four peak hours on a weekday. Their analysis of this and several other counts at various train stations in the system led them to believe that 2% of the passengers traveled to the stations by bicycle and that the average distance to the BRT or rail stations by bicycle from the survey results was 1.8 miles (I read somewhere that the average distance traveled by bicycle in the Netherlands is about 1.9 miles). About two months ago I again counted bicycles at the same locations in North Hollywood and had a total of 660 bicycles in four peak hours. That’s an increase of 7 times more bicycles in less than 3 years, although these counts were not in the same month or hours as before. The cycling rate in that area seems to be increasing rapidly and that has to be partially due to the more than 150 miles of bike lanes that were installed throughout the city in the last two fiscal years. There is also some similarities when comparing what happened to passenger rail in Southern California and bicycle riding in the Netherlands post WWII. As the real estate holdings of the streetcar company depleted, and automobile use greatly increased, streetcar ridership declined and so did its usefulness to the private owner. Scarcities during WWII brought streetcar ridership to an all time high and then after the war the massive buildup of the freeway system starting in the 1950’s made traveling by car quicker and easier than being stuck in mixed traffic in a streetcar that is traveling at a much slower average speed. This and the lower expense of running buses on existing roadway caused the elimination of the streetcars entirely in the Los Angeles area by early 1963. The oil crisis of 1973 not only sparked an interest in investing in transit and bicycle infrastructure in the Netherlands, but it was also part of the inspiration for the idea of trying to revive the passenger rail system in Los Angeles county, along with the need to accommodate an increasing population and also environmental concerns. LA County voters approved a never ending 1/2 cent sales tax for transportation in 1980 called Proposition A that enabled the first new light rail line to be completed in 1990. Then another in perpetuity 1/2 cent sales tax called Proposition C was passed by voters in 1990 that had an even higher percentage devoted to transit after Metro indicated that it did not have enough funds to complete upcoming projects on time. President Obama’s election in 2008 had another 1/2 cent sales tax on the ballot for transportation called Measure R that was approved by county voters which upped the percent of the revenue going towards transit once again, but this sales tax had a expiration date in 30 years. In 2012 voters were told that if the Measure R sales tax was extended another 30 years, then these future tax revenues could be borrowed against to speed up the construction of highway and rail projects listed under Measure R. That new ballot measure fell just short of the more than two thirds majority of votes required to it approved. In 2012 these three 1/2 cent sales taxes brought in $1.8 billion for transportation in the county. The problem is that none of these four sales tax measures had any money set-aside for bicycling. Evidently, it was expected that most of the train users would get to the stations by way of a bus that is stuck in mixed traffic on congested streets, or else walk. Growing bicycle use in the last few years in the U.S. came about mainly from increased funding for bike ways from the state and federal government and not from local sources. A big reason that Portland has the highest commuting mode share for any of the largest cities in the U.S. is that since 1972 one-percent of funds for new highway construction in Oregon has been allocated to bicycling. Los Angeles city council members approved setting aside 5% of the 15% local returns from Measure R to pedestrians and another 5% to bicycling. This works out to about 75 cents for bicycling out of every $100 from this sales tax that will be spent in the city on transportation. Los Angeles is the only one of the 88 cities in the county that chose to designate a percentage of their share of this revenue to fund bicycle improvements. Having a bicycle modal share of only 1% in 2011–and 11% for transit–might seem that there is much less potential demand for bicycling than transit. It may also indicate that there is much more untapped potential for growth in bicycling compared to transit. Even though most of the recently added bike way mileage in the city of Los Angeles consist mainly of paint treatments on roads and the capital improvements for transit involves creating a much higher quality and more reliable service than existed before. Installing bike lanes on 8.5% of the arterial streets throughout LA in only two years increases the likelihood that an increase in bicycling as a result of these changes is immediately measurable in the annual census bureau survey results. Having 52 of these bike lane miles installed the first fiscal year and then a almost doubling of that with another 101 miles the next year creates a unique opportunity to what degree installing bike lanes influences the volume of bicycling. This also reduces the chance that a sharp fluctuation in the economy, new transit rail lines, or a sudden rise in fuel prices could be reasons for the change in the volume of bicycle riders. You then can go to the politicians with data that can help justify spending more money or for taking away road space from motor vehicles for bicycling. Excellent post, it demonstrates that sustainable modes of transportation are mutually supportive. I agree wholeheartedly; though you can also interpret this in a wider sense to also include train ridership: the bike parking facilities you describe also will make taking the train, in combination with biking, a more attractive option. Everyone benefits. Utrecht won’t be ready before 2018. Reviewing based on an ‘artist impression’ is usually a bad idea. Amsterdam is also building new facilities for 10.000 bikes as part of the reconstruction of the central station area. The current famous temporary ‘fietsflat’ should be redundant after that, but it’s quite likely that it will be converted for permanent use, since there’s a huge demand for more bike parking. This entry was posted on 1 August 2013 by Bicycle Dutch in Original posts and tagged cycle parking, Haarlem, Houten, railwaystations, underground parking, Zaanstad (Zaandam).